Ironically I am without many words to express how my heart sunk moments ago when I read that Maya Angelou has made her transition. My early teen years were heavily influenced by this poet. This voice, story, and heart grabbed my little mind at a critical time and threw me into a wild love affair with words and lyrics that I'm still blushing about to this day. I recited her poetry as an early teen before I started writing my own. I remember picking up a book simply titled, "Poems" in the 5th grade and never being able to put it down. While some of her life experiences both tragic and beautiful were way beyond my comprehension- it was her ability to use words so well that attracted me. Words absolutely love her. I remember her speaking at Bill Clinton's swearing-in in 1993. I was so young, but I remember even then, that deep, slow, and smokey voice entering my ears. That "peace" On the Pulse of the Morning is still one of the greatest collections of words that I have ever heard. After that I met her in a small meeting in my hometown. I had actually recited, "Still I Rise" a few times. As she recited it on stage, I sat there mouthing it with her line after line in the front row. Her embrace and acknowledgement that she'd seen me at the end of that event will forever be held in my heart. While no details have come about just how she passed away, it is widely known that she hasn't been in the best of health in the past few years. Her 86 years of life were filled with some incredible stories, and I'm honored to have not only been alive in her time, but to have embraced her. While I'm sad that she has passed, a writer like this one never ever dies. Never. 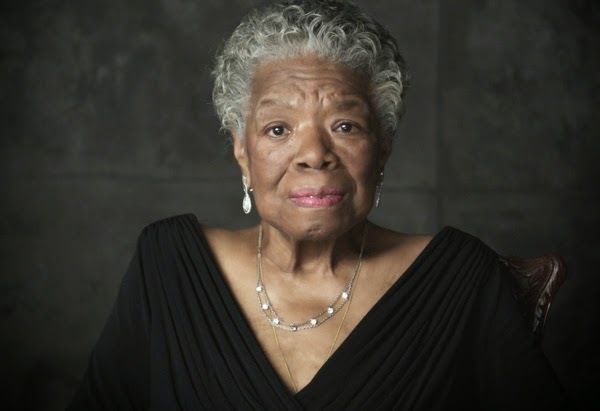 Rest in Love Dr. Maya Angelou!